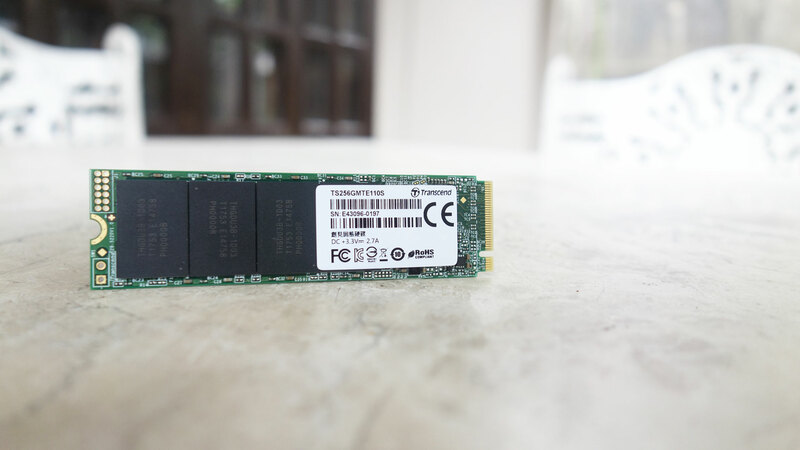 Transcend released its first NVMe SSD early last year with the launch of its MTE850 M.2 SSD but that and most of its subsequent M.2 SSD solutions have been geared towards embedded applications rather than directly being designed for general consumers. Earlier this year though, the company finally released the MTE110S or, as it’s listed in the packaging, the PCIe SSD 110S. The new MTE110S is the company’s first NVMe M.2 SSD that’s designed specifically for consumers. Much like the MTE850, the 110S features 3D TLC NAND flash memory and a PCIe Express Gen 3 x4 interface. It comes in an M.2 2280 (22 x 80mm) form factor design that makes it easily compatible with many motherboards. All of the drive’s components are installed on one side of the PCB, with no bells and whistles such as a built-in heat sink or shroud. Given its price tag only around $100, the simple design of the 110S is to be expected. The 110S is available in 128GB, 256GB, and 512GB configurations. As previously mentioned, the 110S features 3D TLC NAND flash memory. Specifically, the 256GB configuration of the 110S has four 64GB memory chips that are coupled with a SM2263XT controller, the new DRAM-less controller from Silicon Motion that was introduced earlier this year. The new controller supposedly opens up the possibility of high-performance SSDs at more affordable price points. As such, the 110S is rated with read and write speeds of 1,800 MB/s and 1,500 MB/s, respectively. Looking at our results, the Transcend 110S was able to easily outperform the Kingston A1000 in both 4K read and write tests on both AS SSD and CrystalDiskMark. While the difference in the read tests were minimal, with both drives even scoring the same in the AS SSD 4K read test, the write tests are where the 110S starts pulling away from the A1000 with significant jumps in performance. Notably, the 110S was also able to trump the A1000 in the sequential read tests of both AS SSD and CrystalDiskMark but lost in the sequential write test of both benchmarks. The ATTO Disk Benchmark results also tell an interesting story. The results show that the when it comes to write performance, the 110S caps its performance at around 800 MB/s once it reaches transfer sizes of above 8 KB. On the other hand, the Kingston A1000 is able to breach the 1,000 MB/s barrier but then drops off to the same level as the 110S once it reaches transfer sizes of 4MB and above. When it comes to read performance, the 110S caps off at 1,800 MB/s at transfer sizes of around 128 KB while the A1000 reaches the same cap a bit later on, at 512KB, but quickly drops off to a little above 1,200 MB/s once transfer sizes reach 2 MB and above. The ATTO Disk Benchmark results may show why the A1000 is able to perform better than the 110S in sequential write performance, with its jump to over 1,000 MB/s in our ATTO Disk Benchmark test, even for a little while. Overall, while the A1000 does lead the 110S in sequential write speeds, the 110S performs better in all other areas. Affordable M.2 NVMe SSD options are slowly coming out of the woodwork, thanks in part to cheaper yet capable controllers like the SM2263XT. And Transcend may have a winner for one of their first consumer-focused M.2 NVMe SSDs in the 110S. it may not reach the performance of higher-end SSDs like the Samsung 970 Pro, it definitely performs well for a drive in its price bracket and even competes with some SSDs at higher price tiers. Those looking for a capable M.2 NVMe for an affordable price for their OS as well as a few applications will definitely be satisfied with the performance of the 110S.